Timken Co. showed off its newest local facility on Tuesday with the grand opening of the new City Scrap & Salvage yard in the city’s Kenmore area. TSB Metal Recycling, a Timken subsidiary, bought City Scrap late in 2010 after spending 15 years buying scrap steel from the business. Since then Timken has spent $8 million to build a new warehouse and scrap yard. The new facility has been operating since July, but Tuesday offered a chance to show off the new building, thank city and county officials who helped with the project and cut a green ribbon during a brief ceremony. Members of the Katz family, which started City Scrap in 1946, Timken employees and a variety of Akron and Summit County officials attended. Randy Katz, TSB Metals’ manager for purchasing and sales, said his grandfather, Nathan Katz, was a “junk peddler” when he started the business. “My dad was a scrap man, and now I’m in the recycling business,” Randy Katz said, noting how attitudes have changed during the past 66 years. Russ Pry, Summit County administrator, commended the Katz and Timken families for operating businesses that invest locally. “It’s people who don’t forget their roots” who help a community grow, Pry said. 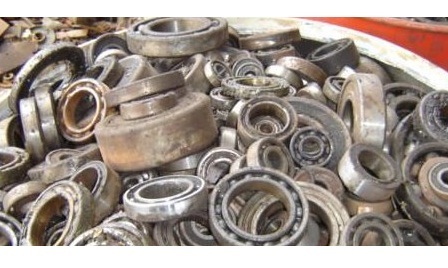 City Scrap is a full-service scrap yard taking various metals, then sorting and processing the material for sale. About 90 percent of the steel received is shipped to Timken’s Harrison or Faircrest steel mills. The remainder is sold to other steel companies. Scrap steel is the primary material in new steel made by Timken, said Dean Devine, general manager of Scrap Sourcing and TSB Metal. Owning an operation such as City Scrap ensures a supply of material, he said. Aluminum, copper and other metals collected at City Scrap are sold to a variety of customers. The new collection yard is about one-quarter mile west of City Scrap’s original location near Manchester Road and Wilbeth Avenue. The new, larger site is across the street from a car shredder that processes about 3,100 tons of steel from automobiles each month. New scales are inside the warehouse so customers can unload scrap without battling the weather. The layout is more efficient and makes it easier to sort different metals. Since the expansion, City Scrap has grown to 40 employees, Randy Katz said. The operation’s sales reached $26 million last year, he said.